The majority of the 160,000 convicts transported to Australia in the nineteenth century were European, yet a small number of colonial subjects were also incorporated into Britain’s Antipodean penal settlements. These included Aboriginal prisoners from the New South Wales frontier. By the 1850s a few Aboriginal convicts were incarcerated at Cockatoo Island,Sydney Harbour, where their comparatively high rate of death attracted administrative attention. This article situates these deaths in custody within the broader history of convict transportation. 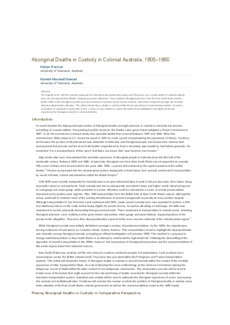 As well as an analysis of comparative death rates it uses a series of case studies to explore the factors that contributed to the higher death rate experienced by Aboriginal convicts in colonial Australia.